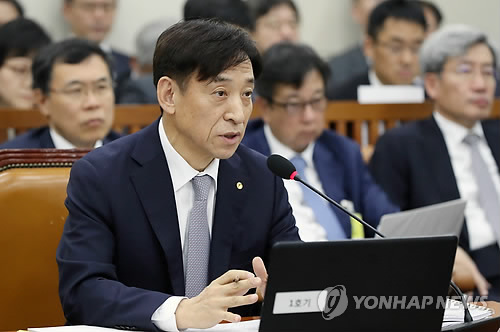 SEOUL, Oct. 22 (Yonhap) — South Korea’s central bank chief on Monday again hinted at a future rate hike in the coming months to solve financial imbalances and secure wider policy tools. “It is necessary to adjust the (current) accommodative monetary policy in a way that eases the financial imbalances and have policy room to deal with a future economic cycles, if external downside risks do not weigh heavily on economic growth and inflation,” . “Currently, the BOK maintains the accommodative monetary policy as external risks heighten uncertainties in the economy and inflation pressure is low,” he added. At the same time, he made clear there are voices for monetary tightening, saying that he will take a more positive approach on the issue at the rate-setting meeting next month. But the central bank chief said he is not sure how many times the BOK can mark up the key rate going forward, as the country’s economic recovery shows signs of slowing down slightly. Last week, the central bank voted to freeze the policy rate at 1.5 percent for the 11th straight month, citing recent poorer-than-expected economic data and escalating global uncertainties sparked by U.S.-China trade rows. Two dissident members demanded a 0.25 percentage-point rate hike, citing massive household debt. The central bank’s tone became stronger to some extent, as the word “carefully” was removed from the statement on the monetary policy decision for the first time in a year. “In this process, (the board) will judge whether it is necessary to adjust its accommodative monetary policy, while closely checking future economic growth and inflation trends,” the BOK statement said. Economists anticipate that the BOK may lift the key rate in November at its last monetary policy meeting of the year, as it has hinted at a rate hike before the end of 2018. A decade of low interest rates has been blamed for inflating real estate prices and mounting household debt, which was approaching 1,500 trillion won (US$1.33 trillion) as of the end of June. But the top monetary policy maker said he is aware of the high-flying housing prices, but he will not adjust the base rate just because of the real estate market. For months, the central bank has been under pressure from the government, which has been struggling to get skyrocketing apartment prices under control. It argues that the large amount of liquidity that entered the property market led to the recent boom in prices. High-ranking government officials including Prime Minister Lee Nak-yon blamed years of low borrowing costs for causing the overheated market. At the same time, Lee stressed that the BOK is free from government pressure, refuting swirling rumors that the central bank lowered the key rate in 2016 on the request of the then-Park Geun-hye government to boost the economy. News reports said that the BOK lowered the base rate to a record low of 1.25 percent in June 2016 after a secret meeting of senior government officials despite some opposition.